After two years in Sri Sathya Sai Higher Secondary School, Pratim cleared the entrance for Bachelors in Sciences (majoring in Mathematics). In 2005 he joined the Brindavan campus of Sri Sathya Sai Institute of Higher Learning. “Brindavan is special for me as it is here that I started singing. The way this happened is also quite interesting. There was a mass Upanayanam ceremony being organised in the Divine Presence and everyone was sure Swami would continue to stay in Bengaluru at least till that day. But to everyone's shock, Swami suddenly left on the morning of June 1. The whole ambience turned silent and sombre. Everyone was sitting and sulking in Brindavan. Even as everybody was trying to reconcile with their cruel fate and thinking how to get Bhagawan back, there was a sudden buzz all around – ‘Swami is coming! Swami is coming!’ Yes, He went in the morning and returned in the evening! Till today I do not know the mystery behind this play of the Lord but what is fresh in my mind even now is the unfettered joy that danced on every face as Swami's car entered the Brindavan compound. The inaugural function of the Annual Sports and Cultural Meet of the University is held every year on January 11. 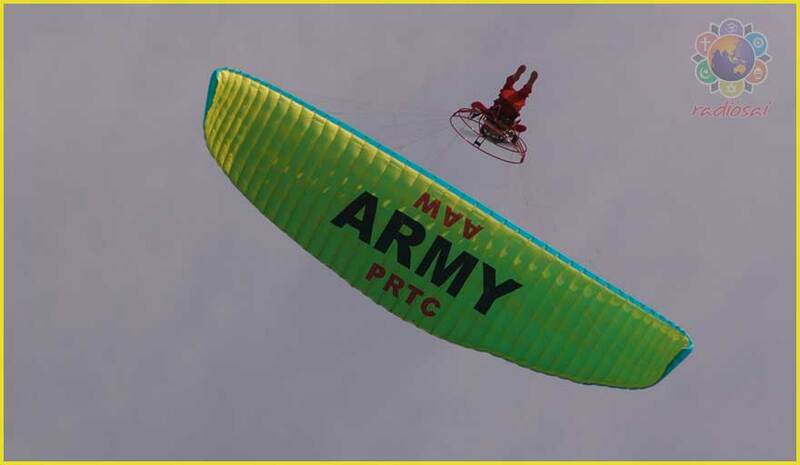 One of the events that Brindavan campus was preparing to present to Bhagawan that year was a display of paramotors, which are basically motorised paragliders. Pratim was excited about this stunt; he wanted to join this team. “But I was not even allowed to appear for the selection process because I was already part of the drama,” he recalls. “Actually that year Brindavan campus had not planned to do a drama. 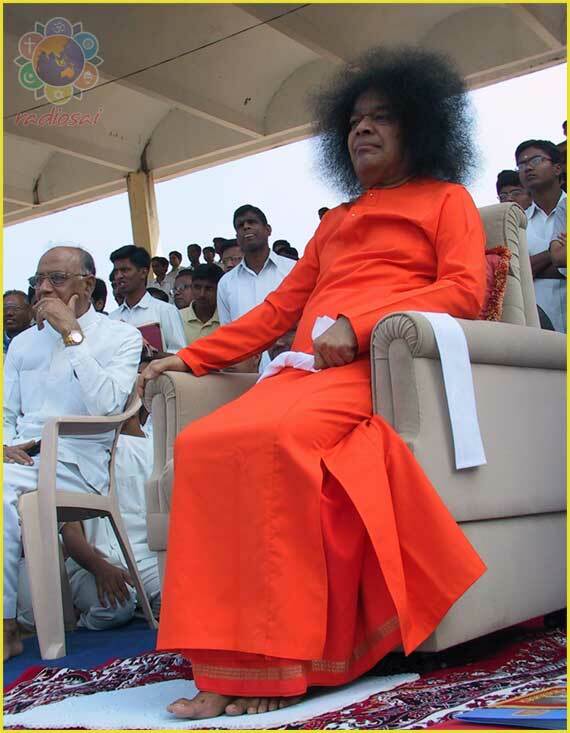 But the Master Manager that He is, Swami went to the Prasanthi Nilayam campus boys and said, ‘Every year Brindavan campus stages a wonderful drama. Why don't you also come up with something?’ Two targets with one arrow! Now there was no way Brindavan could skip the drama. “I was selected for an important role because of which I was not auditioned for paramotors. I was extremely sad. I felt I had it in me to do this event, but all doors were closed. What added to my sadness was a senior who was part of this team. That evening he came to our room and started describing animatedly how fantastic it was to go up in the air, be a bird in the sky, and so on. It only made me feel more miserable. “Well, that was His will. The event did not happen that year. Next year, the same item was proposed and now Bhagawan consented. The teachers in charge said that they wanted to retain the seven boys from the previous year's team but would take a few more from the junior classes to compensate for the boys who had graduated. “Another interesting thing I noticed about myself during this period is how I lost my fear of heights. Since my childhood, I was always scared of heights. Whenever I would look down from my grandmother’s apartment in the tenth floor, my legs used to shiver. But now I had begun to relish being in the air, and in fact was enjoying the panorama below from above. “This was crucial for the stunt because we were completely dependent on the climate. A little too much or too less of air would make our adventure a failure. Generally, the wind early in the morning was not suitable. Similarly the conditions a little later during the day again were unfavourable. We were completely at the mercy of the wind god. That is how the morning practice session at the airport ended. Swami was exclusively with the boys of the Brindavan campus. In the evening there was to be a rehearsal of the events of all the campuses in the stadium and Bhagawan was expected. He did come. One by one all the campuses made their presentations. However, the paramotors event alone was left out. The problem was – unfriendly wind conditions. Bhagawan graciously responded to the request. But before getting into the car He again warned, “That is okay, but safety is most important.” After Swami left, Pratim was the first one to take off from the airport. He had no clue that Swami was no more in the stadium. He was supposed to go up, wait for his partner, and then together they were to land in the stadium. As Bhagawan had mentioned, landing in the stadium was a completely different game. On one side of the stadium was a hill, while on the other side were buildings not as high. So the wind would hit the hill and bounce; there would be great turbulence up there. 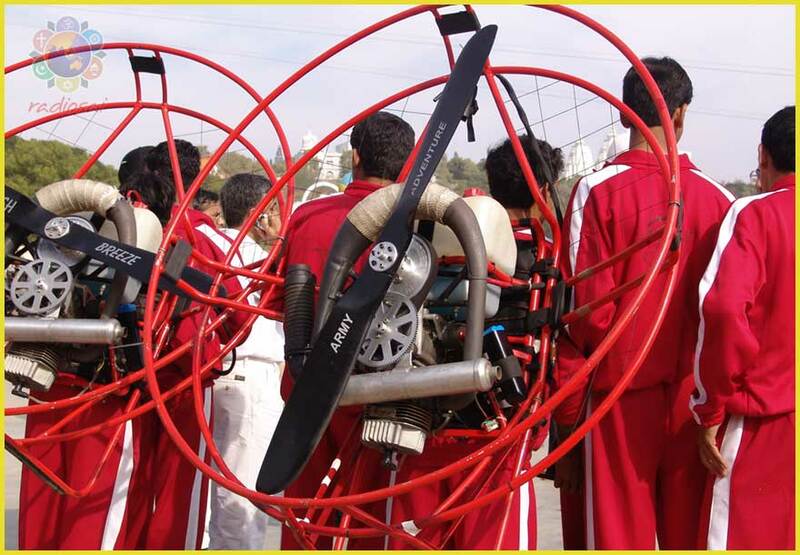 A delicate contraption like the paramotor could easily get blown off in that chaos in the air. Lost in this reverie, Pratim was singing to himself and happily floating away. Suddenly there was a beep and he got the message that his partner had taken off, and the Brigadier, in an anxious tone was asking him, “Pratim, I want you to locate the stadium”. “That is when I looked down between my legs and I found it difficult to spot the ground,” Pratim recalls. “I was frantically searching for the stadium. Only then the gravity of the situation hit me. I was so lost in my inner musings and music that unmindfully I had travelled too high into the sky. It was evening and the warm air from the ground had just lifted me in an upward spiral. Only when I looked down keenly, could I spot the ground; it looked like a tiny saucer, and the statue of the 65-feet Hanuman was not even the size of my little finger. My instructor was now screaming, ‘Have you any clue at what height you are in now? You are at least 3,000 feet high! Come down immediately!’ I followed his instructions, and instantly reduced height to a desirable altitude without much problem. “Now I was to land. I knew the route thoroughly – above Music College, the Institute Campus, Higher Secondary School, Primary School, General Hospital and then smoothly glide down. But that evening, in my impatient exuberance to exhibit my exceptional talent to Swami, I decided to take a short cut. So instead of flying beyond Primary School and going above the General Hospital, I turned above the Primary School itself. The reason? I could not wait to get the pat on my back from Swami and then the resulting ‘hero welcome’ in the hostel to the ‘Star of the Sports Meet’. “In that restless excitement I veered my motor hastily. And the next moment, to my horror, I found myself heading to dash straight into the tall globe pillar of Chaitanya Jyothi museum. My mind went totally blank. The collision looked inevitable. I did not know what to do. ‘Increase the throttle! Go high!’ Again my instructor yelled. I acted, just in the nick of time. Thank God! I missed the pillar by a whisker. I managed to whiz past it by some unknown force. But when I opened my eyes now, there was an even bigger obstacle in the front! The pillar was gone but I was about to ram into the Chaitanya Jyothi Museum itself! ‘Take 180 degree turn!’ My untiring inspector bellowed one more time. I instantly did that. I was saved. “The instructor and the teachers rushed towards me. I was alive, breathing and conscious. I was immediately taken to the General Hospital. The doctors examined me thoroughly and declared that they could not find any anomaly in my body except for a few bruises that needed first-aid. Really? It was unbelievable for all. I had no pain, no discomfort, no trauma – no sign of any tragedy or accident. 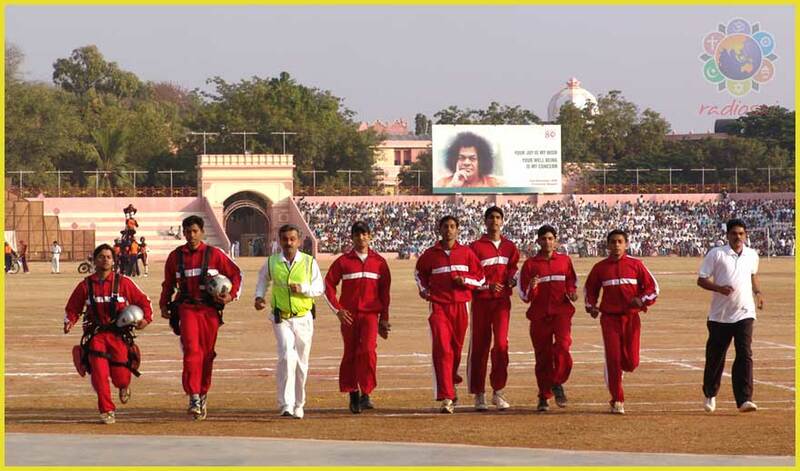 “The next morning Bhagawan came to the stadium. Fortunately I was allowed to perform and this time I executed a perfect landing! Immediately after this, all of us, the paramotors riders, ran across the stadium to the dais and placed ourselves at His lotus feet. Bhagawan was too happy; He seemed so proud of us. Right then and there, He gifted each of us huge cups. What a fantastic moment it was! The finale of this entire paramotors penance could not have been any more divine and blissful! “The story does not end here. On January 9 when I had prayed for good wind conditions, He had said, ‘I will give’. This is indeed what He blessed me with on the day of the performance – the morning of January 12. I distinctly recall how that morning Swami was expected to arrive at 8 am but to everyone's surprise He came a good 45 minutes early. The wind condition then was most ideal, and that is how we did a perfect landing in the stadium. It was one of the most fantastic moments of my life. “However there is another angle to this incident and when I think of it, I only mutely marvel at His magical way of doing things. In my XI and XII grades I was the athletic champion at the Higher Secondary School. The only motivation for me to toil and work hard for this achievement was to receive a cup from His hands. 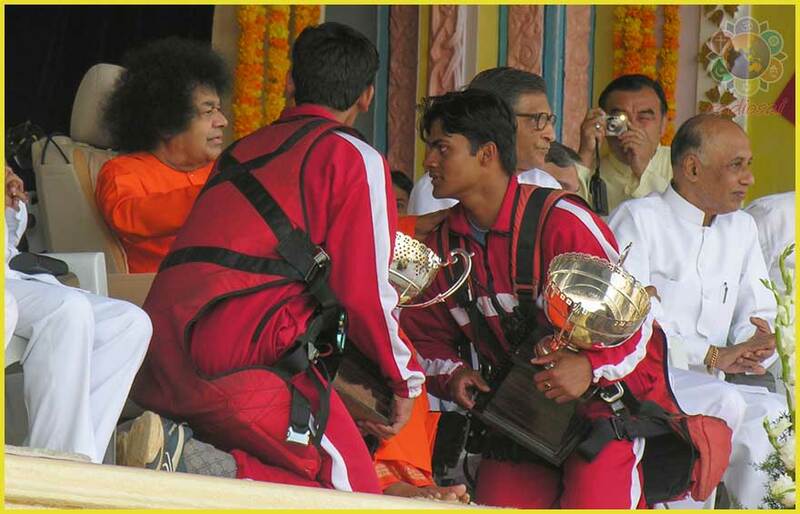 In the first ten years of this School, Bhagawan used to personally give each student the prize(s) they had received in the annual competitions. In the later years He gave cups with His own hands only to the champions; rest of the prizes were blessed by Swami and distributed by a guest. My dream was to receive this cup from His hand. But to my great disappointment, in my XI and XII grades, Swami personally awarded only the campus cups and not the championship cups. In fact on both these occasions my parents had flown all the way down from Jamshedpur to Puttaparthi hoping to see me accepting cups from Swami's hands. Obviously, they were hugely disappointed on both the occasions.